Merchant Square are encouraging a healthy start to the New Year by handing out free fruit and juices for you to tuck into on Tuesday lunchtimes during January. Paddington’s newest foodie arrival, Bar Torelli, has taken root next to Station Bridge, just outside Paddington Station’s canalside exit. Board the Electric Sledge at Merchant Square, to enjoy your Christmas favourites with a South African twist this December. Instagram heaven for cake lovers arrives on Spring Street, Paddington. 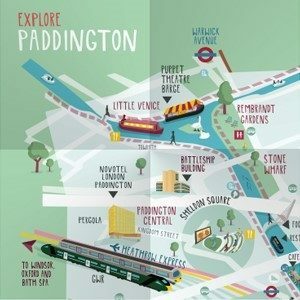 Enjoy a pleasant hour or two perusing the products at Paddington’s Floating Market.